With this UI kit you can build an attractive and minimal social apps.It’ a free cross-platform UI kit and designed by Invisionnapp. It comes with 45 design templates, 15 categories, and more than 99 UI components for web, tablet, and mobile, the creative opportunities are limitless. The UI kit comes with Photoshop and Sketch formats. Inside Relate, you’ll find completely customizable, scalable vector shapes. The high-resolution, retina-ready components are designed to delight, and the grid system keeps everything organized. 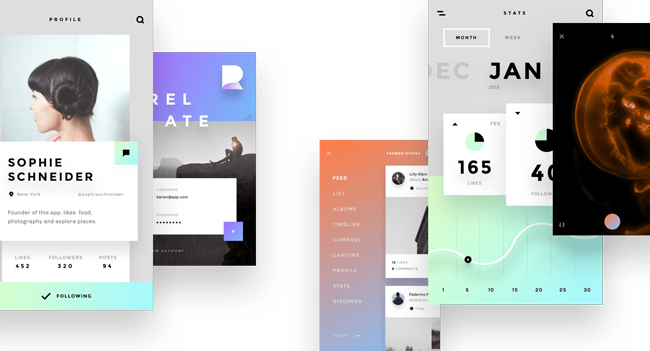 Fresh and flat, Relate’s minimal aesthetic ensures your user’s focus is content, not UI. Every component snaps together seamlessly with Relate’s 12-column grid design. Its vector-only shapes scale to any size and are retina-ready—no optimization needed. Relate uses common and easily accessible web fonts for easy editing.